May this message find you all well; and, riding the energetic waves as they begin to penetrate NEW frequencies through every cell in your body. During the months of April & May there is an influx of energy coming into play, so get your “Soul Sail” ready to guide you on a grand adventure like no other. The God particle within all is activating the higher frequencies and revealing wisdom & knowledge that already lies within….it’s just been dormant for eons. This is causing what my channel is calling “The Grand Global Awakening” which is now about to switch into full gear…so hold on! Everything is made of energy and the incoming universal energy is turning up the notch so every living organism can to begin to implement and active these new frequencies that are now available for all to tap into. You may have noticed that the ringing in your ears is getting stronger and/or your emotions are all over the place. Crying then laughing then getting angry…whichever “Boys – aka ego” present themselves, please just go with the flow, for this is part of the “21 Day Energetic Process”. One must learn to express their emotions instead of suppressing them, for this will only lead to a mass explosion down the road. When one puts band-aids on life experiences, there comes a time when the band-aid must come off….and that time is NOW! Over the next few months, we’re all going through a “Soul Wash”…some will just get more of a cleanup then others, really depends on what frequency you’re currently tapped into and how you navigate through the upcoming energies. Each and every one of us is being giving an opportunity to spread our wings and fly. To take that leap of faith and allow the soul to guide the way! Whatever needs to shift…will! Please trust this process. And for some, they’ll be moving into the new, without even knowing it! And as those around you begin to wake up, be there for them, however do not try and tell them what to do. Every journey is unique and special, so allow them to ask what it is that they feel they need help with. “The Grand Global Awakening” is allowing truth to be revealed at warp speed. Watch what is unleashed over the next few months. The veil of deception is unraveling quickly as humanity begins to come out their zombie trance. Please understand that when one lives in alignment with the energies of New Earth, the old no longer resonates. That’s why we’re going through a total “Body/Mind/Spirit” makeover; where all must be aligned to move forward. For many of the lightworkers, the “Spirit” side is too high in 5D fufu land – this causes them to stay in delusional stage for they’re NOT balanced with their “Body & Mind”…their NOT grounded on planet earth! Remember Body is 3D – Mind is 4D – Spirit is 5D+. We channel the 5D+ which is a state of conciseness that travels through our energy fields (aura & chakras) into our 3D body which then rewires our mind in 4D+. Please let go of the phrase “I want to live in 5D” for the only way to do so, is to pass and become Spirit yourself! With so many old terms/labels still lingering, it’s no wonder so many are stuck in delusional stage. There are so many false promises that have been made in the old energy – promises that never should have been made to begin with. No one knows what New Earth entails. However, there are storytellers who think they know it all, so they keep repeating the same old, same old story…then adding “this is the way it is”. Little do their followers know they are keeping them stuck in the delusional stage – by keeping them connected to an energetic beast they have all created together…called “I know the truth, not you, so let me brainwash you with my perspective!” Which is huge on this planet right now – just look outside, you can see it everywhere! So it does not surprise me that April & May are going to be months that give so many a reality slap, causing them to wake up and stop blaming others for their reality! 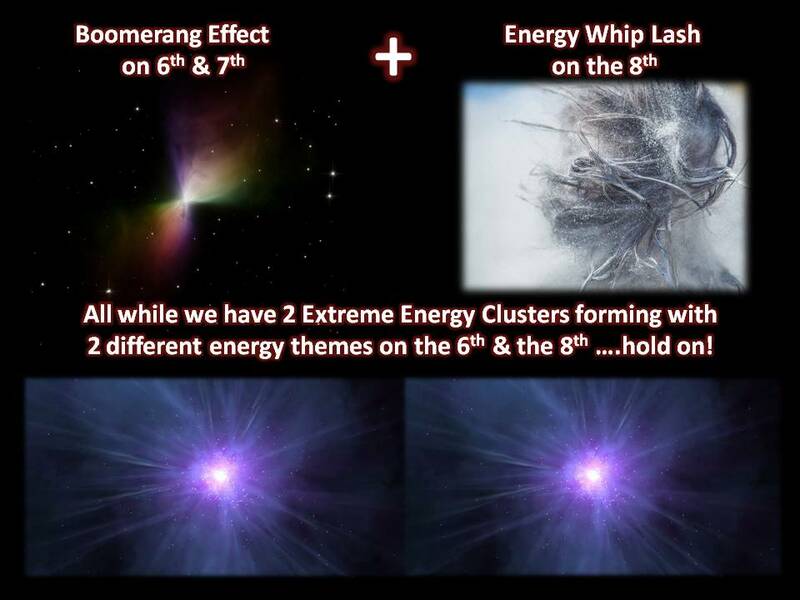 We’ll be encountering energetic waves we’ve never felt before – which will be causing the “Soul Wash” effect. We’ll be incubating, implementing and activating (IIA) new frequencies at a DNA level, all at the same time! AND there will be Boomerang Effects that will take place on April 6th & 7th and from April 16th straight through to May 24th! YES, that is correct – 39 days of multiply Boomerang Effects…hold on! Which leads me to why it’s so important to truly understand the “The 21 Day Energetic Process” for it now comes with “The Boomerang Effect” (implementing & activating at the same time) and “Energy Whip Lash”(energetically leaving the 21 Day Energetic Process and solidifying it into your reality) which by the way, ALL have different energetic themes! On a deeper level, the 10 so called “garbage” DNA strains we have, are the ones being affected by this process, these DNA strains are the ones amplifying the God particle within all. So as we get deeper into the “Soul Wash” in April & May – on an energetic level you’ll be healing & shifting at warp speed. The question is, will you be shifting forward or backwards? If you’re spinning down the rabbit hole, please know you’re going the wrong way! Ascension as you all know is not an easy task. It takes hard work to heal within and believe me when I say “We’ve only just begun”. Becoming “Ego Friendly” not “Ego Driven” is so important. The ego is not going anywhere that is until you leave your physical body. No one said this was going to be easy process; we just assumed or expected something completely different. But guess what? That was “The Boys” talking. Mr. Expectation does not live in 4D+ energies. As for Mr. Assumption, he can as long as you only set boundaries…you get into details and Mr. Assumption will lead you to Mr. Disappointment who is Mr. Expectations BFF! Again, we have NEVER been this evolved so be good to yourself, do not beat yourself up by allowing “The Boys” to take you down in your head. There is no wrong or right to what you are experiencing – you’re just experiencing, which is what we are here to do. We’re co-creators, and we co-create through experience. So make sure you do your “Shadow Work” so that you can get through this “Heal & Shift” process – coming out squeaky clean! Your true authentic self is ready to make a grand appearance, however before it can do so, you must enter the “Soul Wash” and go through incubating, implementing, and activating process. We’re all going through it, so be kind and gentle to yourself and others, knowing you understand at a deeper level what is truly going on! Thanking you in advance for paying if forward!